We culminate the "side deck week that could have been" with yet another card that just doesn't quite cut it into a side-deck. This one's a bit more obvious than the others; Final Countdown was obviously never intended to go into any deck outside of one specifically dedicated to it. Players have achieved great success with this card featured in a deck with little to no monsters. It's rather unfortunate that this highly underrated wrecking machine has been stuck into this tidy Friday slot, but we can still find time to review it, can't we? The Final Countdown deck should be built with longevity in mind. This means cards like Emergency Provisions, Mirage of Nightmare, Thunder of Ruler, Waboku, Frozen Soul, Scapegoat, and other such cards should almost all be maximized. Then, and only then, will you begin the long and laborious process towards Final Countdown fulfillment. Let's rate the card in its own deck! Advantage F/H: See, the right Final Countdown deck is basically paying one card and 2000 life points, or about 3500 life points total (if you count the "going rate" players are willing to pay for a card), to (hopefully) insure fulfillment. If you've noticed, there's a lot of parentheses in this equation, but the Final Countdown decks only win condition is Final Countdown. This makes Final Countdown the only sort of advantage the deck can have. Best Draw for the Situation: The problem with this card is that you only need one at any given time, but you'll still have to run 3 to draw it fast. Therefore, while it's the only card you truly need in this deck, you'll also have numerous situations where you do not need it. Attributes/Effect: Obviously this card is what makes the Final Countdown deck possible. It's also the only card of its kind in existence. Dependability: You'd have to ask a seasoned Final Countdown professional for figures, but I don't think this deck is very reliable (otherwise, we'd see it at more regionals). I'm not a pro, so I'll just speculate on its win percentage. Oh yeah, it's also not searchable. The Bottom Line: Try making one! -- Detracts from Resource Replenishment, Energy (life point cost). I never viewed Final Countdown as much of a side deck card. I only see it being sided (or mained) in two decks; burn/stall and defensive Exodia. For burn/stall, you're already running the preventative cards -- Level Limit, G-Bind, Messenger of Peace (But MoP will cost you another 1,000 LP throughout the 20 turns of Final Countdown...) and the Solemn Judgments that would generally keep your stall alive, so it's a fairly good idea to have an FC or two handy. For Exodia, it's a failsafe -- not only are you running the stall for it already most likely, but it gives you a second way to win if a limb gets removed from game, or your Head goes to the graveyard and you don't have a way to get it back. If played first, it could cause an opponent to panic and attack face-downs recklessly -- ones that could help you get Exodia to your hand. If played after the piece is removed, it might be against an opponent that exhausted all their resources to prevent you from assembling the Exodia win. Final Countdown is a great card -- I just see it as a main deck strategy rather than a side deck option. Coin Flip Final Countdown is the last re-review we have before we move on to Flaming Eterntiy cards, becuase, well, EMoD got wind of the release and will gladly tell us all that cards already fetching 20 bucks on eBay are pretty damn good. This isn't a good sideboard/side deck card. In fact, it's not even that great a card by itself. You lose 2000 LP just to activate it, and then its effect doesn't come into play for what can seem like years. That said, it isn't connected with the rest of the week's cards, obviously. But let's go deeper. Your opponent has 10 turns to cope. Let me demonstrate how easily one survives for two-four turns with only a few cards. Level-Limit Area B, Scapegoat, Metamorphosis, White Magician Pikeru. Once they get rid of your T-ER, they have to eat their way through what might have become 15000 LP while dealing with a various number of counter traps you may have. Oh, and because of Area B, their monsters are shifted to DEF before their effects activate (Mobius, Breaker). Doesn't take too long, surprisingly. A Waboku saves you for one turn, a Sakuretsu saves you for another, Scaring Roar (a new FET card that is quite akin to Waboku) stops all attacks, including those of DDWL. Get a draw engine like Mirage of Nightmare or Des Lacooda to replenish your chainable (and non-chainable protection and you could be going for quite a long time. Scapegoats serve as defensive walls, Meta food, and LP gain for Pikeru... I was happy to see other users shared my logic on the deck when I saw Skaxkx putting a similar deck together on the forums to the one I had run two weeks prior. I’m a big fan of Final Countdown. I just love alternate win conditions, and Final Countdown is one of the most fun of all of them. Once you play it, you don’t need to protect any special cards or make sure you draw the right things – you just need to make sure you don’t die for a while. And that’s certainly easy enough to do. The cost is pretty big, a hefty 2000 Life Points; but that’s nothing compared to what it brings you: VICTORY! I’ve built decks centered around Final Countdown, and I seldom had trouble getting a Final Countdown toward the beginning of the duel. Once you’ve played it, just stall. Run Spirit Reapers, play Gravity Bind, and all of that rentsy nonsense usually reserved for Burn. Another interesting tactic I stumbled across is the use of Giant Rat. Giant Rat is capable of summoning both Gear Golem the Moving Fortress and Labyrinth Wall, both excellent defenders – and, I might add, excellent food for Mystik Wok (a nice asset to the Final Countdown Deck). Get out Labyrinth Wall and Wok it – bam, 3000 more Life Points for your opponent to get through. Giant Rat can also summon Obnoxious Celtic Guardian, a great stall monster; and Kinetic Soldier, an amazing stall monster against Warrior Decks. Don’t run Final Countdown unless you’re building your entire deck around it. If you toss it into any old deck, chances are it’ll hurt you more than help you. But if you do run it correctly, your opponent is in for an unpleasantly boring surprise. Our final card for Side Deck Week is for some reason Final Countdown, a card that allows an automatic victory. To activate Final Countdown you only need to pay a measly 2000 Life Points. But wait! It gets better! 20 turns after Final Countdown’s activation, you automatically win the duel! Now I’m all for alternative means of victory, but the chances that a duel will last 20 turns is not high considering most duels last 12 turns at most. To achieve it though you’ll need to be running some kind of EXTREME Stall Deck that works for you and your opponent. Why stall your opponent? Well, many Decks are extremely speedy, and as a result your opponent may Deck-out before Final Countdown kicks in. Of course a win’s a win so you really don’t need to stall your opponent, but if you’re going to pay ¼ of your Life Points, I’d think you’d want those lost Points to do you some good. 17 turns by activating only 3 otherwise useless cards! Isn’t that great? All in all, keep Final Countdown in an extremely dedicated Final Countdown Deck, but if you want my opinion (and who doesn’t), just go for a Stall or a Deck-out Deck. Advanced: 1.5/5. Keep it in casual. Traditional: 1/5. Keep it in casual. Art: 2/5. So what is it? Clouds with a face? Some weird UFO? What?! Well, this in an interesting card to be reviewed as the final installment of “sideboard” week, especially given the fact that until now I never even considered running it outside of a full-blown Final Countdown deck. Sooo this means let’s take a look into the purpose of Final Countdown, which is obviously to stall out for “10” of your turns once you have activated it. I don’t know about you, but to me, 10 turns of a game is a long time to wait for victory. So, even without all the stall and support of a Final Countdown deck, what might this card still be worthy against? Burn, perhaps? This seems redundant, but basically the only time you start to think about using such jank methods as stalling out for 20 turns usually is as a metagame-responsive call. Now, we all know burn will go for the 20 turns necessary, so we must rather examine whether or not this card makes the cut. First off, you have to pay 2000 LP. If I was playing burn and you started out with 6000 LP, I wouldn’t care how many turns I have to win I’d be happy. It’s just that 2000 LP is a serious amount to pay for an effect that is not immediately incumbent upon the game. Now, going this route means that you must also DRAW a final countdown very early on (or you WILL burn out, quite literally), which probably necessitates having multiples sideboarded. This also means that each successive time you draw a Final Countdown you have ‘wasted’ the turn. These are definite drawbacks. However, the bonuses include the fact that the effect lasts even if/when they flip Fiber Jar, and going this route means you don’t have to worry about the traditional anti-burn “removal” cards such as max-ed out Dust Tornados, Swarm of Locusts, or Greenkappas. But you WOULD need to include more protective cards such as Hallowed Life Barrier or Pikeru’s Circle of Enchantment. If you ask me, this just starts to add up to a very unstable equation, and if you’re forcing yourself to toss HLB or PCE into the sideboard, you might as well add the normal removal and make your “burn sideboard” something simple like 3 DT and 3 PCE. Don’t mess around sideboarding this card. b) In order to be effective you must run multiples, which means clogging the deck and/or sideboard with more than one copy of this undistinguished card. Oh, I bet I enraged someone with that last sentence, so to be fair, let’s look at Final Countdown in THE RIGHT DECK, and maybe I’ll be a little more sympathetic to its cause. Okay, I believe when you base your deck around this card, with support from Waboku, Hallowed Life Barrier, Scapegoats, Thunder Ruler, Spirit Reaper, Messenger of Peace, Gravity Bind, Level Limit Area B, etc (basically, whatever stall card you see fit to toss into the deck), that this is a very powerful card. It forces your opponent to go into a hyper-adrenal state because the clock is ticking and they must race it to win. Then, it’s your job to simply frustrate them from doing so, and you should win with those 6000 LP in a “short” 20 turns. 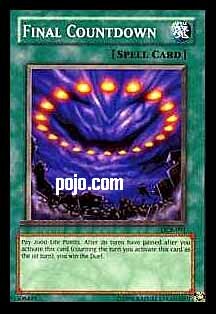 Final Countdown is a Normal Spell card. Its effect puts a lasting condition on the field, and it’s hard to imagine it really benefiting from being a Quick-Play, Trap card, etc. Said condition is that after activating this card, you need to keep track of the turn count. When the 20th turn (after the activation of this card) ends, you win! You do count the turn you activate this card. Now, this isn’t the greatest win condition: in my experience, when you have competent duelists with solidly constructed decks, games end before this threshold quite often. Without outside help, one would expect at least half of all duels to last less than 20 turns. Not only do you need them to go at least that long, but you have to factor in drawing and successfully using Final Countdown. Now, there is one last consideration for the basic mechanics of this card: you must pay 2000 LP when you activate the card. Ouch. That’s like getting ht directly by a Berserk Gorilla. Then again, it is akin to paying 100 LP per turn of the count, so it’s not quite as bad as it sounds. So how should this card be used? I myself view it as an “insurance” policy. While it doesn’t happen that often, there are still enough games that hit 20 or more turns that make something to conceivably use. Still, most decks would be better served with another card to end “tie breakers” or turn around “losing” games. There are two exceptions I can think of though: stall/burn decks and decks specifically built around using Final Countdown. Stall/burn decks can both make use of this card (good incase your opponent takes anti-burn measures), and it can also be used to attempt to counter them (when coupled with other anti-Burn options, it can work). To use Final Countdown in its own deck mainly revolves around getting it out and then finding ways to speed up the turn count. How does that work? Well, to get it out you have cards like Painful Choice (coupled with Magician of Faith and/or an upcoming card from Flaming Eternity that lets you discard a card from hand to topdeck a card from your Graveyard. Pyro Clock of Destiny is a normal Trap that moves the turn count ahead by one. As such, A Cat of Ill Omen and Mask of Darkness would be useful as well. Anyway, I like this card and use it in my Chaos Necromancer deck as that deck tends to win or lose slowly. Traditional: 1.5/5-Usually, you’ll only succeed in speeding up the game… as your opponent now needs to do 2000 LP less. Advanced: 2.5/5-A little more useful here, as it can be used to slightly augment a strong existing deck. Limited: 3/5-The LP cost will hit you harder here, but games do tend go a bit slower without the power combos to speed things up. This card is just a little too long term to be practical. Most games will end before the effect will culminate, even with support. 10 turns, even had the LP cost been half your LP (4000 would be too hard to use) would have been juuuuuuuust right.